Nach der Kollision einer Fähre mit dem Containerfrachter MERCOSUL SANTOS, werden 9 Fahrgäste vermisst! Der zur Maersk-Reederei gehörende Frachter hat auf dem Amazonas zwei Fähren unter sich begraben. Eine sofort eingeleitete Suche nach den Vermissten blieb bis Redaktionsschluss erfolglos! A team from the Fire Department, including divers, followed from Santarém to initiate searches for the disappeared. The Fluvial Captaincy also followed with a team to the place and informed that it will open an investigation to investigate the causes of the accident. The ship is standing at the crash site with two ferries stuck in the bow of the vessel. Other ferries are drifting, according to the Fluvial Captaincy. The site of the accident is about an hour by boat from the port of Óbidos. By telephone, company manager Bertolini, Juraci Neri, said he sent a team to the scene of the accident and is awaiting the opening of the investigation that will investigate the case. The manager also said that the company will collaborate with the investigations and will give all necessary assistance to the families of those involved in the accident. Mercosur said it is working with local authorities and has started searching and rescuing crew members. Still according to Mercosur, the concern of the crew of the ship was with the safety of all members of the ferry crew and finalized informing that all crew members aboard the Mercosul Santos are doing well. 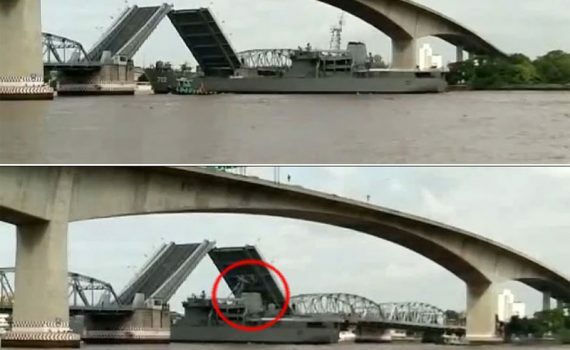 Die HTMS SURIN der königlich thailändischen Marine kollidierte auf dem Weg in die Werft auf dem Chao Phraya Fluss mit einer Brücke. Nach Angaben der Marine sollen Hochwasser und starke Windböen für die Kollision verantwortlich gewesen sein, denn trotz Schlepperhilfe wurde es aus der Fahrrinne gedrückt. 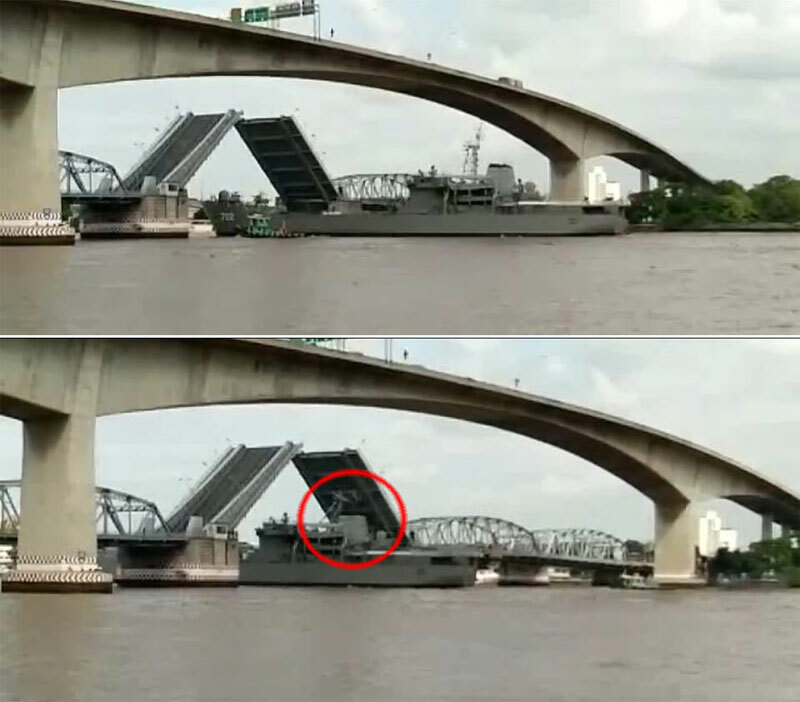 Royal Thai Navy amphibious ship HTMS Surin collided with Krungthep Bridge, Bankgok, in the morning Aug 3. The ship was proceeding Chao Phraya river downstream, bound for Naval Base after completing repairs at Shi Repair Dock in Bangkok. The mast of HTMS Surin was dented and actually, torn off its’ fixings. High tide and gusts of strong wind are blamed for a mishap, the ship, even with tugs assistance, wasn’t able to keep position and strayed off fairway, colliding with the swing bridge. Royal Thai Navy Amphibious ship HTMS Surin (LST 722), displacement 4235 tons, length 109 meters, max speed 16 knots, commissioned 1988, 53 crew, 348 troops, 1-2 Bell helicopters. Die Segelyacht CAPELLA ist vor Ostende in holländischen Gewässern nach einem Kielbruch sofort gekentert. Das in der Nähe befindliche Saugbaggerschiff REYNAERT leitete sofortige Rettungsmaßnahmen ein und konnte die Besatzung bergen, welche sofort per Helikopter ins Krankenhaus geflogen wurde. Leider wurden bei der Rettungsaktion auch zwei Crewmitglieder nur noch tot geborgen. On July 1, 2017, around 2 p.m. the “Reynaert” rescued three crew members of the sailing yacht “Capella” from Breskens which had participated in the Light Vessel Sailing Race from and to Zeebrugge. The boat had lost its keel and capsized off Ostend around 8 a.m. The crew also recovered two dead from the sea, one man remained missing. The victims were the well known yacht designer Frans Maas (79) and his Dutch crew mate Freddy Franssens (70). Missing was Hannes Goegebeur (18). The son of Frans Maas, Andreas Zwanenburg (17), the Dutch Robert Tan (53) and the Belgian Jan Toussein (37) were rescued and taken to hospital and declared during interrogations that the keel of the yachht suddenly had broken off and that the “Capella” immediately turned around so they had no chance of sending a distress signal. The lifeboat “Sterke Dries” recovered the wreck of the yacht and towed it to Ostende.